Aspyn Repp dribbles the ball. The senior midfielder started her second-straight game Thursday. Heading into Thursday’s game against Indiana, Northwestern had trailed only twice this season. However, both times they fell behind, the Wildcats failed to come back and win. So when the Hoosiers’ (7-6-2, 3-5 Big Ten) Allison Jorden found the back of the net early in the first half, No. 25 NU (9-4-2, 3-4-1 Big Ten) found itself in a position in which it has struggled to find success. But the Cats rose to the occasion. 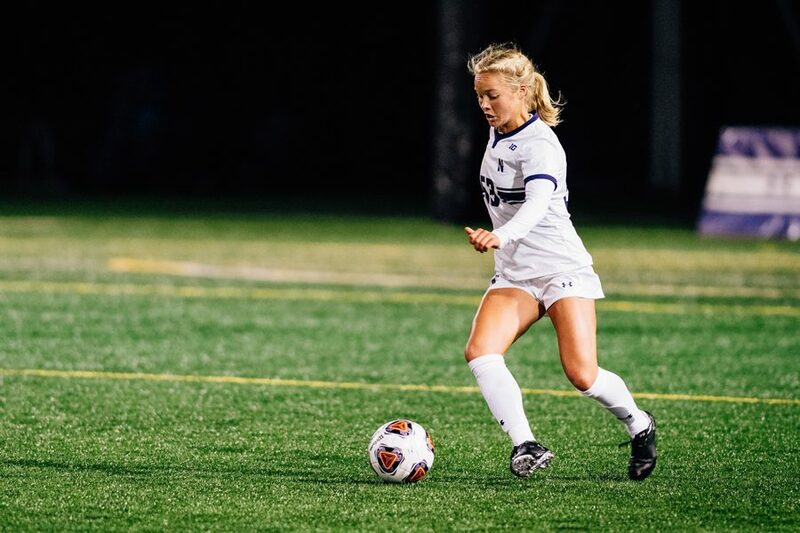 NU came back with goals from senior forward Brenna Lovera and sophomore forward Nia Harris to net a 2-1 win at Martin Stadium and bounce back from a two-game losing streak despite playing without senior midfielder Marisa Viggiano. The Cats came out of the gate with sustained possession, controlling the ball and working both flanks, but Indiana took advantage of an early opportunity. Senior defender Hannah Davison tactically fouled Annelie Leitner, giving the Hoosiers a free kick from just outside the center circle. Hanna Németh sent the ball to an open Jordan in the box, who headed the ball backwards over freshman goalkeeper Mackenzie Wood and into the goal. Looking back on the team’s reaction to the goal, coach Michael Moynihan said he wasn’t concerned. As the half entered its final minutes, Lovera swung in a cross to Harris, who volleyed it into the crossbar. A minute later, freshman defender Julietta Thron played a long send to Lovera in the box, who brought it down, cut past her defender and scored, sending the Cats into halftime tied at one. In the 47th minute, a handball call on freshman defender Kaylee Titus off a cross led to a penalty kick and Indiana sent Leitner to the penalty spot. Her penalty shot was destined for the bottom left corner, but Wood made a strong stop to preserve the deadlock. “I knew that the game was on the line, but then again I tried to calm myself down and just trust my instincts and I read it right,” Wood said. In the 56th minute, a recovery in the corner and cross by sophomore midfielder Regan Steigleder forced Kopel to lunge forward in an effort to tap the ball out — but Harris found the end of Kopel’s tap and sent the ball into the top corner. The goal allowed NU to slow down and play a passing game, controlling the ball without forcing opportunities. The win marked the Cats’ first win this month and only the fifth time all season NU has scored more than one goal.